At this year’s San Diego Comic-Con, Skull Island was announced, an origin story to King Kong made by Legendary. Today, both its director and its star has been announced according to Coming Soon. Jordan Vogt-Roberts will direct, while the movie will star Tom Hiddleston…aka Loki. The goal of the movie is apparently to truly stay on the island and explore what makes it so dangerous and mysterious…you know, aside from a giant gorilla. So, what do you think? Do you want to see the origins of King Kong? Let us know! 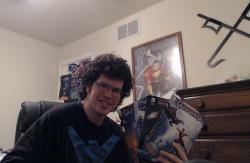 Todd Black is reader of comics, a watch of TV (a LOT of TV), and a writer of many different mediums. He's written teleplays, fan-fictions, and currently writes a comic book called Guardians (guardians-comic.com). He dreams of working at Nintendo, writing a SHAZAM! TV series, and working on Guardians for a very long time! TV REVIEWS: FTN Reviews The Gotham Series Finale! WATCH: Holy crap! DC Universe’s Swamp Thing series trailer goes full horror movie!